Valley Jazz Voices (VJV) brings together singers and audiences who are passionate about jazz vocals. Directed by Jeff Olmsted, VJV performs a rich and diverse repertoire drawing from swing, bebop, cool, Brazilian and pop inspired jazz arrangements. 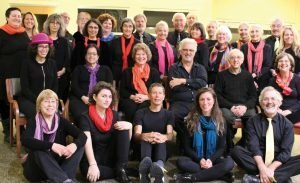 The only community jazz choir in the Pioneer Valley, VJV brings the joy of jazz vocals to audiences across the region.